You may still be overwhelmed by the news of IBM acquiring Red Hat for approximately $34 B, third largest tech acquisition/ largest software acquisition ever. Here is my take on why this acquisition and expected outcomes. Acquisitions are complex with only handful being successful so far. While I don’t have any crystal ball, this is my take on who wins/ loses from this deal. While open source software is consumed widely across enterprises, rarely do enterprise customers consume open source software directly without any external support — either through open source vendors like Red Hat, Cloudbees, Cloudera or through Service Providers. Enterprises need stability, reliability, and performance; they want end-to-end solutions, not piece meal software. Depending on their technology maturity, they may not even have the necessary expertise in-house to manage the life cycle of the open source software. This is all the more relevant to enterprises who are not in the business of making/ selling software/ applications. This is where this acquisition makes the most sense: enabling such customers to consume open source software better. Red Hat has been the most successful open source vendor, easily poised to cross $3 B revenues in 2018. They are able to provide the stability and reliability that enterprises want to all layers of the stack — operating systems, IaaS/ PaaS layers, storage, middleware, applications, and management products, through their technology, consulting, and support services. IBM still has the mindshare among enterprise customers. IBM has reversed their pattern of declining revenues in the last three quarters and the revenues from services/ strategic imperatives are more than half of IBM’s Q2 2018 revenues. This acquisition combines the strengths of Red Hat (open source technology) and IBM (services, enterprise mindshare), and is positioned to enable enterprise customers consume open source software easier and better than before. You may not like this: no matter how you position it, there is only one way to make money through open source software — services. You can package it any way you want — licensing, subscription, packaging, distribution, consulting, or anything. But at the end of the day, it is revenues through services that drive open source revenue. Enterprise IT services spend far outweighs spend on software. Considering new market realities as well (Microsoft is now the largest contributor to open source projects, cloud service providers are supporting/ funding/ contributing to more open source projects than ever) Red Hat seemed to have reached their maxima given their setup (sales, channels, partnerships, etc) and this acquisition appears to be the best exit for Red Hat. While it is easy to do armchair quarterbacking, I would love to see IBM consolidate all of their software development around Red Hat BU (not IBM Research though) and continue to build on their sales, channels, and services muscle to deliver the products that come out of this BU. This acquisition is also the boldest bet on the new Queen Makers/ King Makers: developers. 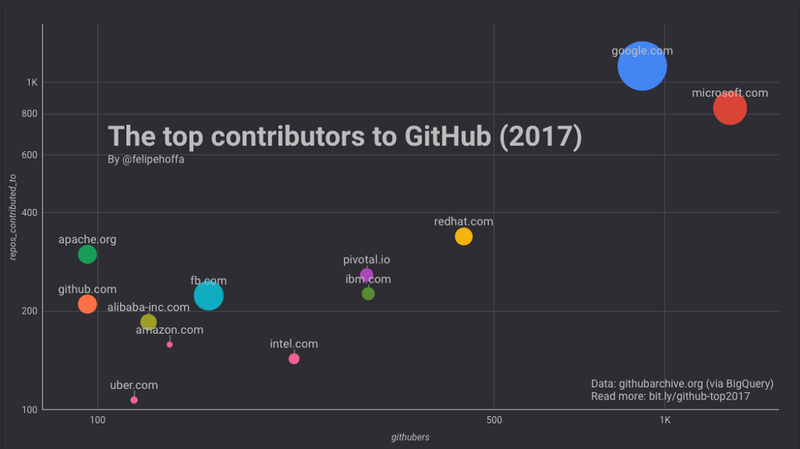 Despite their continued support to open source from early on, IBM doesn’t have the mindshare among developers. Recent debacles with their public cloud & private cloud experiments, Watson, etc, have only worsened this. Popular sentiment among developers about this acquisition in social media has also not been positive. This acquisition provides a chance to gain IBM’s mindshare among developers. IBM’s history with acquisitions is not in favor of this acquisition. IBM and Red Hat cannot also be further apart culturally. It is important that IBM keeps Red Hat BU as independent as possible, and the aforementioned Red Hat BU leverages IBM’s enterprise mindshare and sales muscle to the fullest. Overall, this is a good news for end users/ enterprise customers and open source communities.